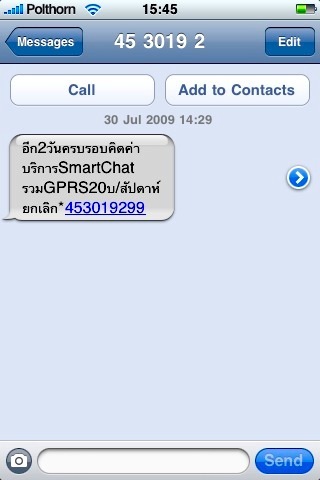 Restart: Thai TelCo(s) and Service Procider(s)... are they Cheating? Thai TelCo(s) and Service Procider(s)... are they Cheating? So it means that I have been using their service from one of the provider and they also charge for usage of GPRS in conjunction with GPRS service. Did you see something wrong about this? If not, I am happy to enlightening you by the fact that, on top of 10 times higher than unlimited package, I have also been charged for using GPRS in conjunction with one of the service offered by third party (MSN Client on Symbian Platform). This shouldn't happened as GPRS (10 times worth more than unlimited package) should superseded all of GPRS usage no matter what other services should be, and in this case, the third party offered client application for "FREE OF CHARGE"! As soon as I got myself together (from anger), I called AIS Call Centre to ask them what happened? They simply replied that I could actually 'Cancel' the service by pressing some combination stated. Why would I be charge twice for the same kind of services? When did I activate this service and how? AIS couldn't answer me both questions, believe it or not! Especially the second question is now still goes on. I will post more about the outcome of this as soon as I got hold of all information, but for now, I could tell you that the service that they tried charging me is something I couldn't use for simple reason, it was an application for Symbian phones such as NOKIA, SonyEricsson, but not for my lovely iPhone! So how did they put me into their services?